I have a field trip to an amusement park coming up this week and there are going to be rides. Is it ok if I go on the rides when I am on my period? Posted 25 September 2015 under Ask Us. If you tend to get nauseous (sick to your stomach) or have bad cramps when you have your period, you will probably not feel up to going on fast rides. 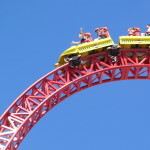 As long as you feel okay, it’s perfectly fine to go on rides when you are on your period. Some people get an upset stomach and/or feel dizzy after going on fast rides but this has nothing to do with your period. Can you get your period while you’re swimming?